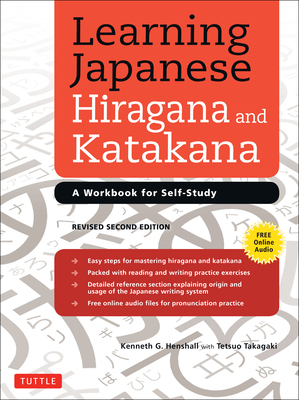 Learning Hiragana and Katakana is a systematic and comprehensive Japanese workbook that is perfect for self-study or use in a classroom setting. Written Japanese combines three different types of characters: the Chinese characters known as kanji, and two Japanese sets of phonetic letters, hiragana and katakana, known collectively as kana, that must be mastered before the Japanese kanji can be learned. Learning Japanese Hiragana and Katakana provides beginning-level students of Japanese a thorough grounding in the basic hiragana and katakana phonetic symbols or syllabaries. A comprehensive introduction presents their primary function, origin, pronunciation and usage. The main body of the book is devoted to presenting the 92 hira and kata characters along with their variations, giving step-by-step guidelines on how to write each character neatly in the correct stroke order, with generous practice spaces provided for handwriting practice. Systematic and comprehensive coverage of the two Japanese kana systems. Detailed reference section explaining the origin and function of kana, and the various kana combinations. Access to online Japanese audio files to aid in correct pronunciation. Helpful additional information for language students accustomed to romanized Japanese. Vocabulary selected for usefulness and cultural relevance. The new third edition has been expanded and revised to include many additional reading and writing exercises. Accompanying online recordings demonstrate the correct pronunciation of all the characters, vocabulary, and sentences in the book. Kenneth G. Henshall has written many books on Japanese literature, history, culture, and language. A graduate of the universities of London (B.A. Hons), Sydney (Ph.D.), and Adelaide (Dip. Ed. ), he is now Associate Professor of Japanese at the University of Canterbury in New Zealand. He has also taught at the universities of Auckland, Western Australia, California, and Waikato. He is the author of A Guide to Remembering Japanese Characters, and the lead author of the revised edition of A Guide to Reading and Writing Japanese. Tetsuo Takagaki is a graduate of the universities of Wakayama (B.A.) and San Francisco State (M.A.) and was a senior lecturer in Japanese at the University of Auckland. He also taught at the universities of Hawaii and Maryland, and at Tsuda College in Tokyo. He is the author of a number of publications on Japanese language and linguistics.